Latest attack aimed at Engineering Corps as they were in the middle of an operation; none were hurt. The Israeli Air Force (IAF) targeted terrorists in Gaza on Friday, hours after an attack on IDF soldiers on the other side of the border fence. 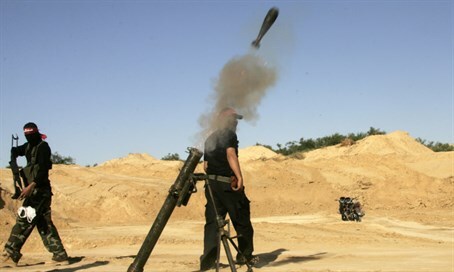 Mortar shells were fired at Engineering Corps soldiers in the Gaza Belt area early Friday, as they were in the middle of an operation unearthing Hamas's terror tunnels under the security border. The morning barrage comes after three separate Hamas mortar attacks were launched at roughly two hour intervals by Gazan terrorists on IDF soldiers near the security border in southern Gaza on Thursday. At least six mortar attacks were launched in the two days before that, but the terrorists were unable to prevent Israel from unearthing a new Hamas terror tunnel on Thursday morning. The mortar attacks have been frequent enough to prompt Prime Minister Binyamin Netanyahu to call an emergency Cabinet meeting late Thursday night to discuss the situation. The meeting was postponed to Friday morning.